A couple of weeks ago, I had the opportunity to explore Delhi from a very different angle to the one which I am used to. Despite my current home department, I’m a social anthropologist by training and practice, and if asked, I’m inclined to explain my preferred mode of working, as (jokingly) ‘liking my humans alive and chatty’. I hope this serves to differentiate me from physical anthropologists, forensic anthropologists, and archaeologists (‘ah, you’re an anthropologist, you must study apes/bones/dead people (-nope! )/pot shards’), although in India, I’m more likely to describe myself as a sociologist, as my work more closely fits with what sociologists in India do. Consequently to dip my toe into the archives was an interesting, sometimes exhilarating, if also rather frustrating experience. So, in that respect, not so far from ethnographic research! Most frustratingly in the archives, which I was attempting to scope in all too little time, more than 50% of the files which I attempted to look at were simply not available. Not so much I think that they had been officially repressed, but given the set up (which I may explain some other time), they seem simply to have been lost. I suspect they have been lost within the archive themselves, filed out of place, or most likely never made it into the crumbling/half-under-renovation building itself. Mostly I ploughed through the indexes of the Chief Commissioner’s office files which ran from 1913 to 1957, containing a varyingly comprehensive list of material produced and filed by a number of different departments. Since this was all new to me, I started, initially with the earliest index (1913), before realising that given my post-Independence interests and very limited amount of time, it made most sense for me to start at the other end. Consequently, I worked my way back from 1957 to 1952. While all were bound in crumbling low quality cardboard covers, the indexes quality and contents of the indexes themselves varied strikingly. The volumes of 1913 were all typeset, consequently it was very easy to skim an eye down each page making them fast to skim read. They were also mind bogglingly comprehensive, hinting at any number of little stories contained in their files, yet it was harder to see large trends within the three years I covered (1913, 1914, 1915). Switching to the 1950s and working backwards through the volumes to give myself an overview of their contents, and as well as to track down those files that interested me, these were very different. These indexes were sometimes thinner (1957 especially) and all hand written in a varieties of spidery scrawl, making efficient reading much slower and the process of wading through 350-400 odd pages per volume, a great deal more tedious. 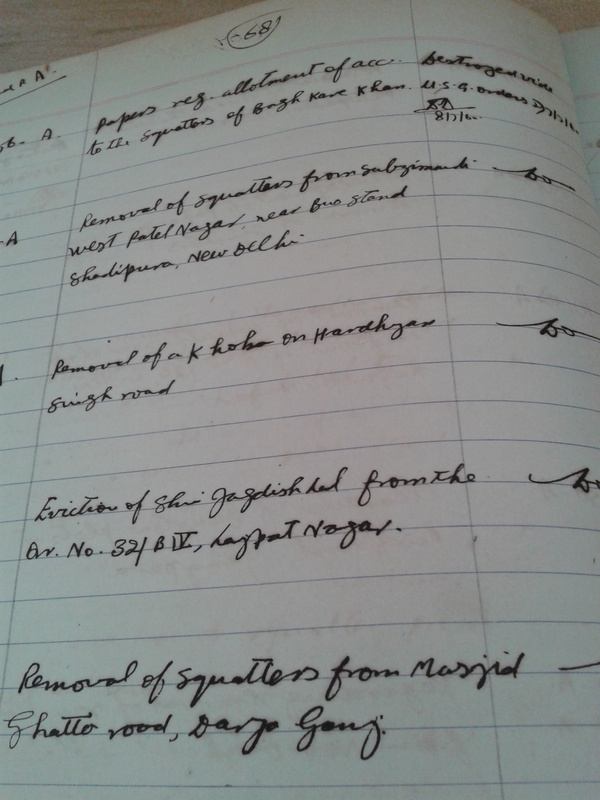 Chief Commissioner of Delhi Municipal Corporation files indexes – the neat versions! Perhaps most off-putting aspect, given my hopes of actually pulling files from the archives through this process, was that most were listed with the apocalyptic word beside them ‘Destroyed’. Is there anything in this archive? !’ I wondered rather despondently as a received all five of the request slips I had submitted two hours earlier back, marked N/F (file not found). The archivist/librarian assured me that apparently some of these ‘destroyed’ files did exist, as ‘destroyed’ did not necessarily mean destroyed (having visions of bundles of papers removed by the truckload, resurfacing as paper bags in markets and bazaars). Destroyed simply meant chucked out in the vague direction of the Archive. That said, the majority of files I called with the note ‘Destroyed’ beside their listing, were indeed apparently impossible for the archivist/librarian to resurrect from the archives’ many rows of dusty shelves. Practicalities aside, the indexes revealed interesting things about concerns, continuities and contrasts between my brief dip into 1913-15, 40 years later in 1950s post-Independence Delhi and the present day. So many of the issues seemed contemporary in 2013, as they were in 1913, a hundred years later. The 1913 archives referred to concerns about the state of the environment, particularly the Ridge areas of Delhi and its role as a green area in the city. While I didn’t pull particular file to look at, it would have been interesting to know who or what is seen as the source of the deforestation. Today the blame is usually pinned on a combination of ‘encroachment’ (with the inference of illegality appended to migration), ill-advised (and hence with a whiff of corruption) urban development in the form of shopping malls, or unauthorised quarrying. I was looking for references to water and health, plans were afoot to ‘afforest’ (a term I thought was an entirely contemporary neologism of Delhi newspapers) the South Ridge. Elsewhere I was struck by the apparent widespread availability of electricity, indicated by accounts of electrification in the city and requests for fans and electrical lighting. In 1915, Civil Lines Hospital receives an X-ray machine. Contrast this with the house I grew up in the South East of England which was not electrified until the late 1950s. From an urban planning perspective, I was intrigued that Shahdara and Najafgargh village were much discussed as areas for development and the increase of housing and urban facilities in 1913. Present day perspectives on Delhi tend to see urban villages as a thoroughly post Independence phenomenon, a product of ‘unauthorised development’ of the 70s and 80s – but this perspective is apparently not new either. Indeed, both the present day Wikipedia pages for Shahdara and Najafgargh hint at the continuingly contested nature of what urban development means and where these two sites ‘rank’ in popular perceptions of place in the city. In 1957, ten years after Independence and the huge population displacements as Delhi Muslims fled to Pakistan and displaced Hindus arrived to Delhi, the sheer level of population upheaval is still being worked through in the city. The Delhi Master Plan is only published in draft form in 1958, and the indexes of files for the Chief Commissioner’s office are full of page after page, after page, of references to plot allotments to post-Partition refugees, squabbles over misappropriated land, and all manner of petitions and goings on of the R&R department (precise name, no one seemed able to tell me, Refugees and Rehabilitation?). One file I did manage to successfully pull from the archive contained the letters of a traders association in NW Delhi battling to get the drain behind them cleaned, and the ‘unsanitary’ nature of the area improved, competing against their clearly better off, more legally settled neighbours. In this respect, the indexes of the colonial era had something of the uncannily clean and tidy about them, rather like reading today’s Times of India, where complexity and struggle of everyday urban life can seem to be have been glossed over and the sharp edges of urban life sanded down. By contrast, the post-colonial file listings contained references to allegations and occasional dismissals for corruption and graft, endless back and forths over infrastructure, far fewer requests for proper summer uniforms for staff, and far more for simple basic services. This felt much more like the Delhi encountered doing fieldwork, where everyday life can be a struggle and access to services requires the careful corralling of contacts, acquaintances and letterheads. In this post-Independence era, the untidiness and brevity of the indexes and records seemed to reflect not just the present day political possibilities of the archives (that can no longer be dismissed as just colonial history), but also where simply less details are kept within the files. Even so, the wheeling and dealing and chai pani [literally ‘tea water’, meaning ‘tea money’ aka a small bribe to facilitate the passage of ‘work’] is still sometimes hinted at in the interactions that went on within and in between those records, that are no longer visible to the historians eye. Not least, who drank tea with whom and the slight felt when the Chief Commissioner refused to drink tea with the less significant traders association. Some of the things in the early colonial era indexes record things that are just so mundane as to wonder why they appear (a dustbin for Faiz Bazaar Police Station). Or they are just bizarre; how on earth is dynamite useful in the pursuit of tree planting?! Surprises still remain too. Who knew there were so many cocaine busts in colonial Delhi? Perhaps having heard James Mill‘s talk on drugs, intoxication and empires last term I shouldn’t have been surprised, but as a child of the 80s, cocaine is synonymous with the images of excess of London financial sector’s Big Bang; power shoulders on jackets, ‘Loadsamoney’, champagne and white powder. So finding something as manufactured and purified as cocaine as the subject of a colonial era drugs bust was a surprise. Other index entries note the conversion of the ‘Hindu Biscuit Company’ to the ‘Delhi Biscuit Company’; why is this recorded? Or what on earth happened to Mrs O’Brien’s horse at the Woodlands Hotel to require compensation for its destruction? Tragedy seeps out of other entries: the removal of Mrs Hinds to the pauper lunatic asylum in Agra. While on a lighter note, the Chaplin of Delhi seemed to have engineered himself near permanent leave from his job (payments and allowances, apparently intact), while my inner Simpsons fan couldn’t help but snigger at the grant of a passport to a Mr MF Shmuck… Bart, I feel, would approve. An ‘Afforestation Scheme’ is going on in the South Ridge in Aug 1913. Noted in Revenue and Agriculture files. Assistant Civil Surgeon, Delhi. Installation of a telephone in the house of – March 1913. Com & Ind. Bills – To suppress the importation of foreign women for prostitution. May 1913. Home dept. Bonus – Application of Mr Edulji for a — . March 1913. Books. Archaeological. Supply of – to Mr Baker. Architect. April. Education dept. Other books supplied at the same time include: Presentation copies of ‘The Tragedy of the Emperor Shah Jehan, and the ‘Delhi Capital Directory’. Buildings. Proposed erection of – On municipal land on Rajpore Road for hotel purposes. 1913. Chenab Trees. Planting of – in the Viceregal Lodge Gardens. Chief Engineer, Delhi. Purchase of 12 Remington Typewriters for – . Com & Ind. Dept. Cocaine. Balance of confiscated – with the Delhi Excise Department at the end of the year 1912-13. Other records pertaining to the limits of possession of, reports and rules regarding the illicit traffic of, and quantity received and issued in Delhi Province. Metropolitan Drinking Fountain and Cattle Trough Association. Proposed erection of a drinking foundation and cattle trough at Delhi by the –. Schmuck. Mr RF. Delhi. Grant of a passport to –. Umbrellas. Decision that process servers in Delhi Should not be supplied with – at Government expense. Webb. Police Sergeant. Deputation of –. To Shimla. Question of grant of hill allowance to –. Return of –. From Shimla. X-ray installation in the Civil Hospital, Delhi. Court. Wearing of Indian Shoes in –. Dacoities. Information relating to –. Committed in Punjab and the United Provinces. Delhi Conspiracy Case. Further grant for secret service purposes in connection with the –. Emigration. Discouragement of Indian emigration to Cuba –. Hinds, Mrs. Removal of –. a pauper lunatic, to the Agra Lunatic Asylum. Hindu Biscuit Company Ltd. Delhi. Change of name to the Delhi Biscuit Company. Ltd.
Hindu Biscuit Company Ltd. Delhi. Offer of biscuits by –. To the St. John’s Ambulance Corps. Native Estates. Exclusion of the educational statistics of –, from the educational report. Reports and returns on Cancer cases. Submission of –. Jun 1914. Home. Workhouse. Proposals regarding the establishment of a –, in Delhi. Excise. Definition of ‘country liquor’ and ‘foreign liquor’ for the purposes of the –. The Hon’ble Mr Justice, Allahabad High Court. Complaint of –, regarding encroachment on his land in Delhi. Tags: archives, Delhi, history, urban planning, urbanisation, water | Permalink.